Hello everybody! I hope you’re enjoying your weekend! Today I thought of writing about my favourite part of routine and favourite kind of products which are Toners. I really enjoy using them and my skin feels the same 😀 I wrote the toners with T, because for me they are the royals of my skin routine and an enormous game-changing element. 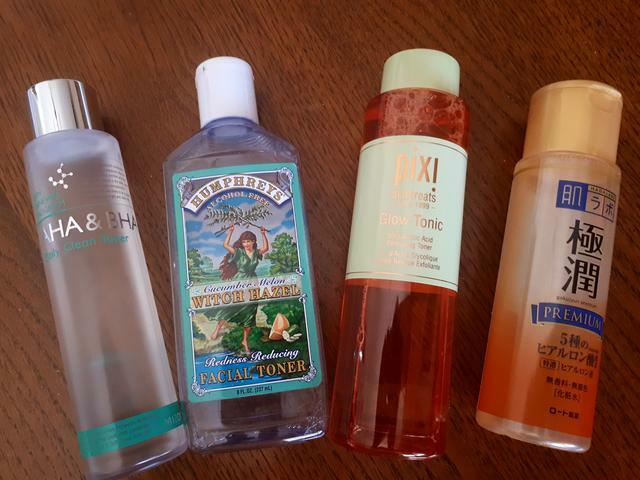 Even before I started to explore Asian beauty range, I was always using the toners (ever since I was a teenager). Last few years I was applying toners like Asian women do, but without knowing it 😂 (dabing in the toners without cotton pads). It’s definetely time to count my toner stash which is not a small one. Mizon AHA BHA daily clean: I use this ph adjusting toner before the acid toners and serums to avoid the waiting time after I cleanse my face. I have no reactions at all, it prepares well the skin for the next acid step. It works well with Alpha-H liquid gold, Pixi glow, my vitamin C serum (Klairs freshly juiced vitamin). Humphrey’s Cucumber Melon Witch Hazel Redness Reducing: I bought it on Iherb since it has really good reviews. Beside acid toners, this is the only toner I use with the cotton pad. I use it always the morning. I do not do a double cleansing in the morning. I apply the micellar water, wash it off and then I apply this toner which really calms the skin and works well for the redness. After that, I continue with other toners. Pixi Glow tonic: I tried the mini size from 2016 Lookfantastic Advent Calendar and I liked it. Honestly I do not see it as proper acid containing toner because it’s really mild. And yet it’s effective and gives the glow to skin. I use this one when I pause from Alpha-H. I use it also once in a fortnight during summer when I know I can avoid a lot of exposure to sun (and off course I put on SPF50). Rohto Hada labo Premium hyaluronic acid toner: This HA acid toner really makes a difference for me, by making my skin really plump and soft. 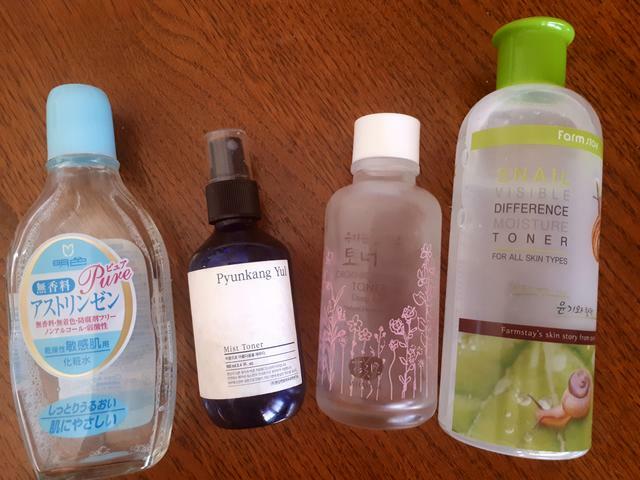 Before I started to use HA toner, I was frightened by the posts in which people were talking about how the hyaluronic acid can sometimes dry the skin. So to prevent this, I always put the tones of hydrating toners before and after putting this toner. The toner itself is great, sinks in fast, it’s not sticky. You need only a small amount for whole face and neck. I decanted it few times and still it will last a long time. Meishoku fragrance free adstringent toner: This is a repurchased item. I have a real love-hate relationship with this one. When my skin is in love with it, this toner calms my skin, tones down any redness, evens the complexion. And then, when my skin hates it, it doesn’t sink in well and it prevents everything else which comes on top of it, to penetrate into the skin. I interpret this as the phase when my skin is overloaded with ceramides. On the other hand, I decanted it to my sisters who both suffer of a mild rosacea and they just love it. Pyunkang Yul mist toner: This is also a repurchased item and I will continue buying it. For me it has a perfect balance of hydration / moisture, sinks in perfectly, makes the skin shinny and supple, works magically with my Hada labo HA toner. I do not sprey it directly to the face, because it will be finished very fast. I sprey it in my hand and then I dab it in the skin. Whamisa Organic Flowers Deep Rich toner: This toner is more like a serum, than a toner due to its viscosity. It does hydrate the skin, but it is, at the same time, extremely nourishing. It’s organic, full of a botanical extracts which give it a specific scent. And with this, we come to main issue for me. Although its scent is completely natural coming from organic ingredients, I just cannot stand it! It’s too strong for my taste and I can feel it much longer, than I want. If it wasn’t for the scent, I would be repurchasing it forever. Farm Stay Snail Visible Difference Moisture toner: How I love this one!!! Big bottle for not a lot of money and at the same time, excellent product. It’s not watery toner, it is more a gel. It sinks in fast and well, it refreshes the skin, plumps it, it is moisturizing and not sticky at all, although it is a snail product. I use it in the morning and in the evening and I always put at least 2 layers. When I started this post, I thought that I would write about all the toners I have: the ones in use and the ones waiting to be opened. However, this would be a too long post, and maybe too boring, so I will write about the ones to be opened in my next post. Till then, stay beautiful and healthy! !